At 3yo and 4yo, the two older girls are holding hands to jump in the pool together. I knew in theory this was going to happen, but when today I actually saw two of my daughters free-swimming (without float-aids) — and with me outside of the pool — I had to mark the milestone. Just in time for summer! At K’s house today, I initially put Brioni into her float-suit because I didn’t want to get into the water. However, she soon requested that it come off because she wanted to play underwater. Although she stayed close to the step, she ventured off time and again for short distances, demonstrating that she can take a breath when she needs to and won’t inadvertently drown from over-confidence. Swimming lessons are the only outside lessons that we’ve invested in, and this has meant a lot of my time as well as the financial outlay. So when I see Aisha and Brioni enjoying swimming unaided, paddling confidently enough that I can relax on the side of the pool, and even making up their own games in the water, I swell with pride. this is wonderful. I hope ella will learn to swim like them soon! It is great to see your girls swimming and enjoying the water. 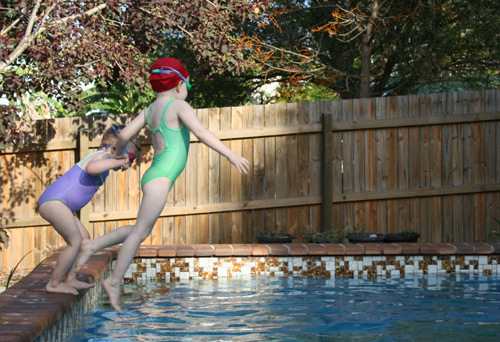 I think swimming lessons are a must if you live in Australia and are definitely worth the financial cost. Well done Lauren – swell on! No Float Suits? AWESOME!! They are doing SO WELL! !